By now we’ve seen everything from Fear and Loathing in Las Vegas to Donald Trump to popular memes processed by neural networks like Google’s Deep Dream. They’re like bizarre drug trips, but without the drugs. 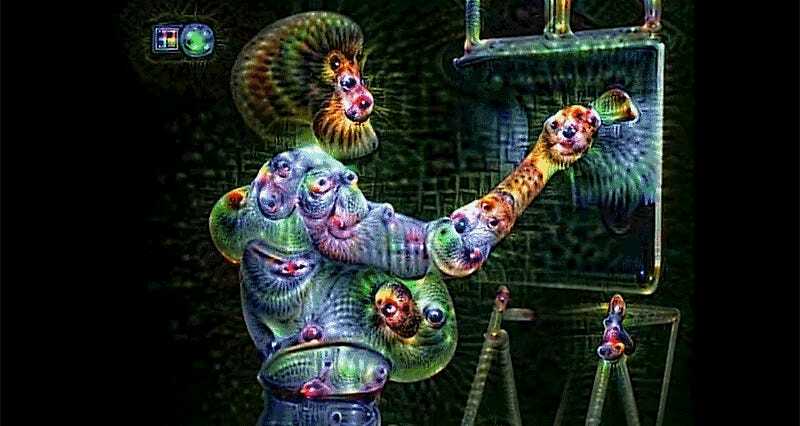 But it was only recently that Alexander Reben was curious enough to see what a neural network would make of the human equivalent of Ambien: painter Bob Ross. Image processing programs like Deep Dream rely on neural networks and artificial intelligence to find and enhance patterns and details in images, often leading to bizarrely over-processed results. But the algorithms can also be tweaked so that the neural networks are working to match parts of an image to other images, like a terrifying version of kids trying to recognize objects in random cloud shapes. It’s those results that will haunt your dreams, when paintings of beautiful landscapes become seething canvases of random creatures. This is all to say: This video is absolutely horrifying, but you should watch it anyway.